This book could not have come at a better time for me. Because of my cholesterol levels, I was told in November to cut down my fat intake and eat a more healthy diet. What I wasn't told was that most "low fat" foods replace the fat with sugar or other processed carbohydrates, which are more fattening that the fat itself. 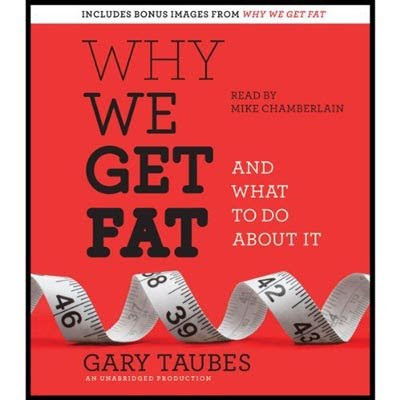 Gary Taubes explains this in his latest book, "Why We Get Fat", which draws from research over the last 100 years, and debunks many popular myths about healthy eating. It's available from Audible. I wish the narrator would not replace the word "causal" with "casual" or "causality" with "casualty" (they mean different things and aren't wrong in the original text) but apart from that the audio book is very readable and accessible, and I have ordered the hardcover book which should arrive next week sometime. I may even lend it to my doctor. Once I have lost or gained weight as a result of changing my eating habits, I'll report back. I have decided not to have any sugar in tea or coffee, and not to eat any bread until my weight goes down to a healthy level. If you need any motivation to cut down on junk food, sugar, carbohydrates and so on, you could always watch the movie "Supersize Me". Scary.